If you have been to Downtown Disney lately, you surely noticed all the construction! The parking is a mess, the walkways are boarded up, & the stores are changing. What’s happened & what is coming? We have some info for you! Two new Starbucks locations have opened. One is located outside the World of Disney store. It is an outside bar type store with no seating. The other location is on the West Side near the Characters in Flight balloon. This is a large Starbucks store & has, in addition to the regular offerings, a Clover Bar which features special reserve coffees brewed to order. Behind the Clover Bar is a screen which shows images from coffee regions around the globe. There is also a Human Connection Wall which is a large touch-screen monitor on which you can draw images. The screen looks like a digital chalk board & also takes a quick picture. It is linked to the store in Anaheim & you can see their images on the screen as well. There is a wonderful outside patio which overlooks the waterfront. It has a beautiful fireplace as well as a “green” Starbucks wall logo. The Marketplace Co-Op has opened. It houses 6 different shops that will change. Currently in the Co-Op is Beautifully Disney (make-up, fragrance, & beauty); Cherry Tree Lane (accessories such as bags, hats, scarves, shoes, & jewelry); D-Tech on Demand (personalized electronic accessories); The Trophy Room (vintage inspired sports apparel & accessories); Disney Centerpiece (home products such as plates, glasses, cups, & decorative items); Zoey & Pickles (girl’s clothes with a Disney twist). The Happy Hound has custom accessories for dogs including dog tags, toys, clothes, & accessories. United World of Soccer has jerseys, cleats, & other sports gear. Food Truck Park is permanently house 4 Disney Food Trucks. So…what’s going to happen next? Lots of changes! 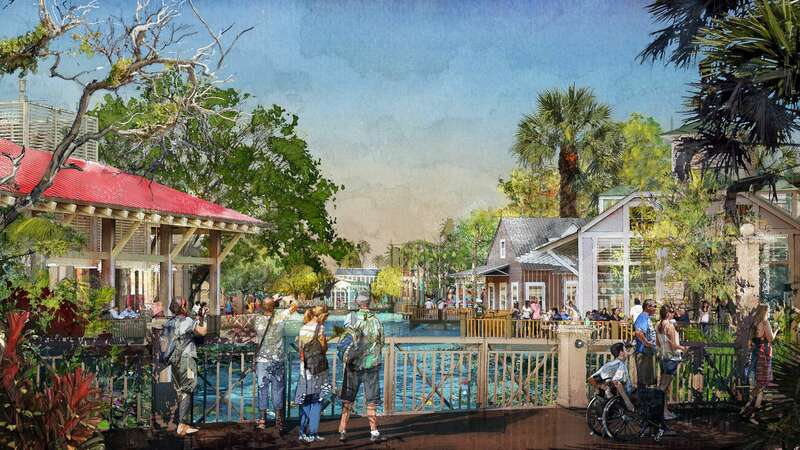 Upon completion, Disney Springs will have 4 distinct neighborhoods: West Side, Marketplace, The Landing, & Town Center. The West Side will have elevated spaces to provide shade & overlooks to the area. 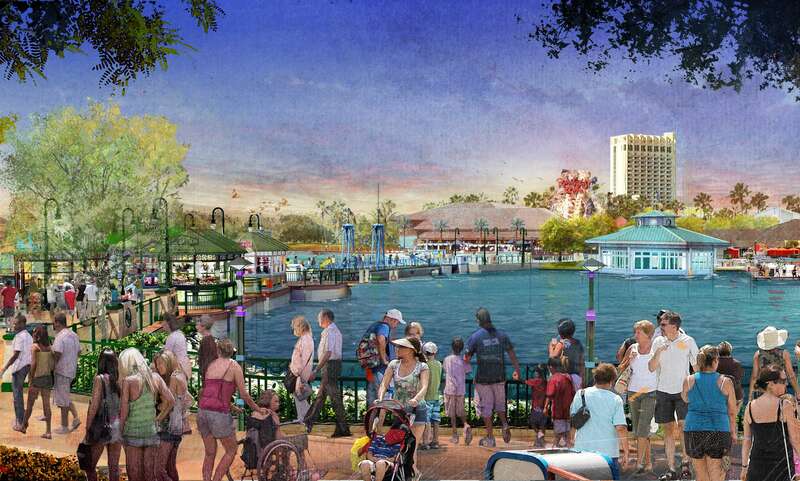 Marketplace will have a new pedestrian walkway over the water & an expanded World of Disney store (really?!). 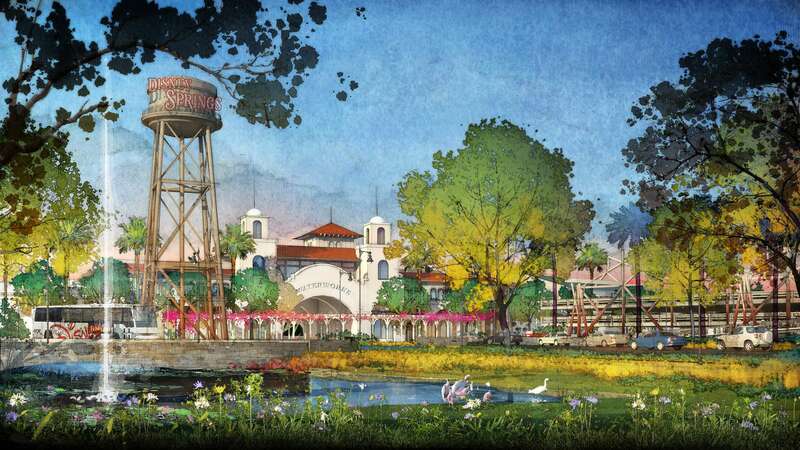 The Landing should open next year & will be a waterfront area for nationally known restaurants. 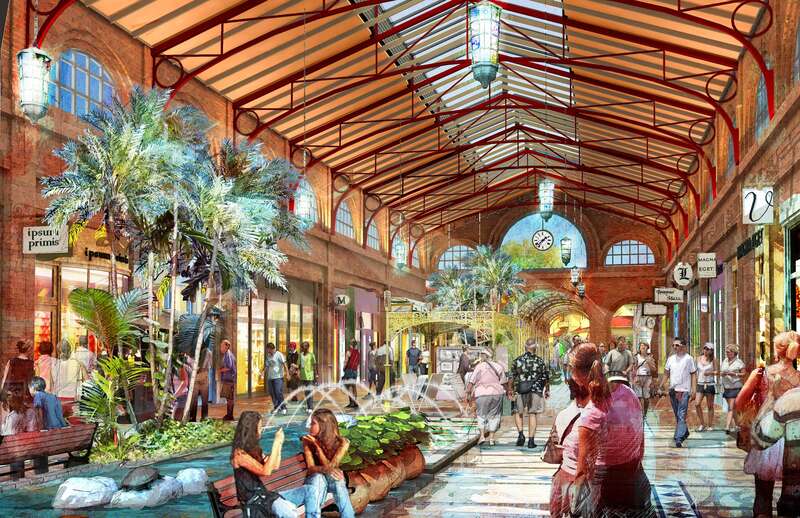 Finally, Town Center will offer even more shopping & dining. In addition, Buena Vista drive will be expanded to 10 lanes with a dedicated bus lane. A direct exit from I-4 to Downtown Disney will also be added. And perhaps the most anticipated addition of all will be 2 new parking garages with 2 pedestrian bridges. 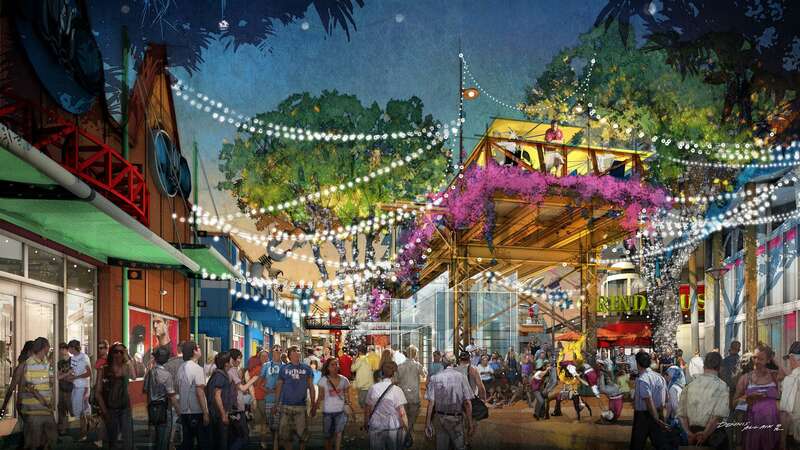 As you stroll through all the construction walls at Downtown Disney, take a moment to look at the murals hanging on those walls for a glimpse of what Disney Springs will look like. 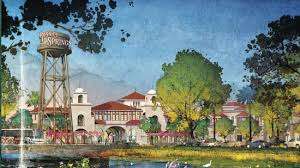 While the construction & parking problems are unsightly & annoying, to say the least, I anticipate that Disney Springs will be worth the wait. What are you looking most forward to experiencing? Next Post Peterbrooke Chocolate Camp: A Sweet Deal In Winter Park!